POSMA Sport is an energetic brand with the mission of offering a wide range of quality outdoor wearable devices to the people who love sport. We hope to bring POSMA into customer's everyday life. GT2 Golf Watch is specially designed for the golf game. Preloaded with over 31,900 global golf courses covering North America, Europe, Asia, Australia, New Zealand, South Africa, no subscription fee and download is required. You can play golf anywhere any time without boundary. Sunrise & fall information of the current location allows you the best time control in golfing. Scorecard helps you to record your past performance in each round and it will automatically summarize the scores during stroke input. Dimension: 2.7"(h) x 1.77"(w) x 0.57"(d). Weight: 1.69 oz (48g). Display Area: 0.87" diameter. Language: English, German, Swedish, Chinese. In the box: golf watch, USB charging clip and user manual. 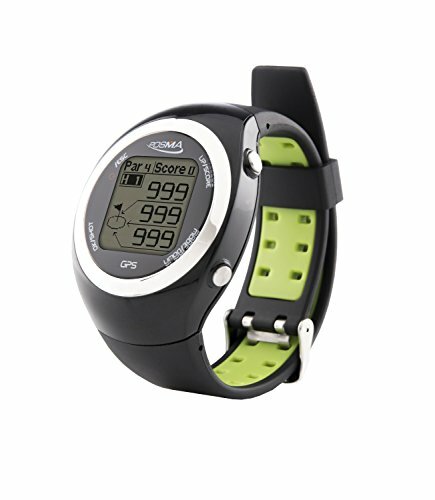 Includes the distance information you need for golfing and a built-in pedometer with activity tracker features. Besides tracking your score, you can also track the amount of your activity (steps) and energy (calorie) consumption during golfing or after play. Golf courses can be found automatically with our built-in high sensitivity GPS chip. Distance to the green edge: accurate distance from your current position to the front, center and back of each green. Shot distance measurement: GT2 tells you the distance of each ball striking as a reference for your next strike. Hazard information: hazards within the course (e.g. lake, bunker, bridge, tree, river) and their distances will be offered to golfers whenever they need to know. Double greens: GT2 enables left / right green changing option (if applicable) according to the situation in golf courses. Daily waterproof & Rechargeable: GT2 allows you to play in any weather at any time with its waterproof ability at IPX6 (not for swimming). It is using a Lithium-Ion rechargeable battery with approximate 8-10 hour in play mode per charge or 8 days in watch mode.